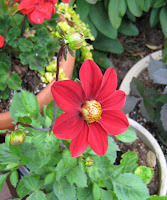 Lynch Creek Dahlias: Brown-Thumb Report: Dahlia's BLOOMING! I'm pleased to report that my dahlia is blooming. Compared to all the Lynch Creek Farm customers whose lovely dahlias are blooming, or working up to it, in great numbers, I realize "my dahlia" sounds incredibly puny. But for years after we moved to our current residence, I planted dahlia tubers only to have them gnawed off within days of emerging. Beer traps, copper strips, salt lines, diatomaceous earth, covered caches of slug pellets: nothing worked. I stopped trying, realizing that I was just wasting great dahlia tubers. So this is big, for me. For the first time in 17 summers at our current residence, a dahlia has survived to bloom. So far, the dreaded incursions of hordes of giant slugs and snails have been kept at bay. 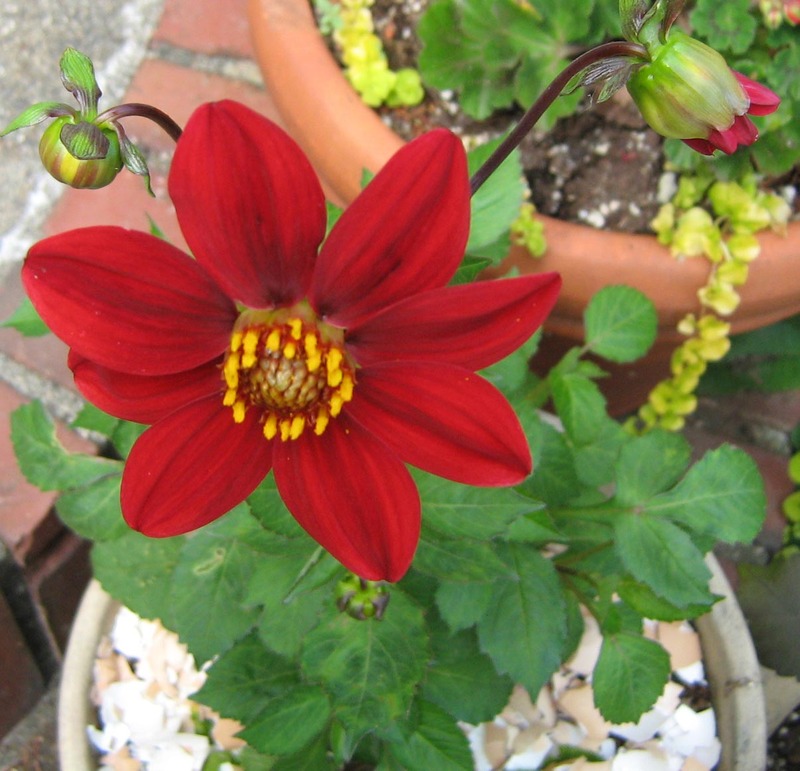 My dahlia, a mignon single called Baby Red, is described as neat and compact in its growing habit. A dwarf variety, these dahlia flowers nevertheless make a great splash in the garden, according to Lynch Creek's online catalog. My Baby Red is making a great splash in its pot on the doorstep. It's next to a trio of Bishop's Children, seedlings of Bishop of Llandaff (these guys don't count because I bought started tubers) and the Baby Red is far brighter than the taller Bishop's brats. Baby Red's clear green foliage is a nice contrast to the zonal geraniums and the purply leaves of the Bishop's Children. Yes, it's in a pot. 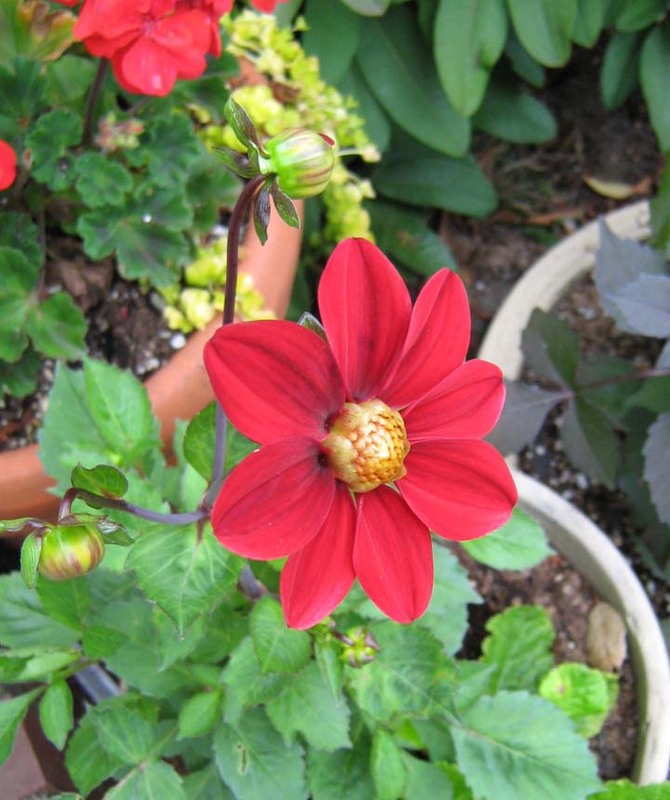 Last year, customer Kristen Haskell commented that growing dahlias in pots eliminates much of the slug and snail problem. While I've lost potted flowers to slugs and snails -- they not only climb our two-foot-high raised beds, they climb the stone fence, the wooden fence and the walls of the house. I have to admit to stashing a few pellets of slug bait on the moist, shaded steps at the base of the pots. And yes, when the tuber was newly planted, I squeezed a circle of that really horrifying Deadline inside the rim of the pot. It smelled so deadly it scared the socks off me, but I guess it scared the slugs too. Now the soil surface in the pot is covered with eggshells, another reader recommendation for keeping the molluscs at bay. We'll see how that works. 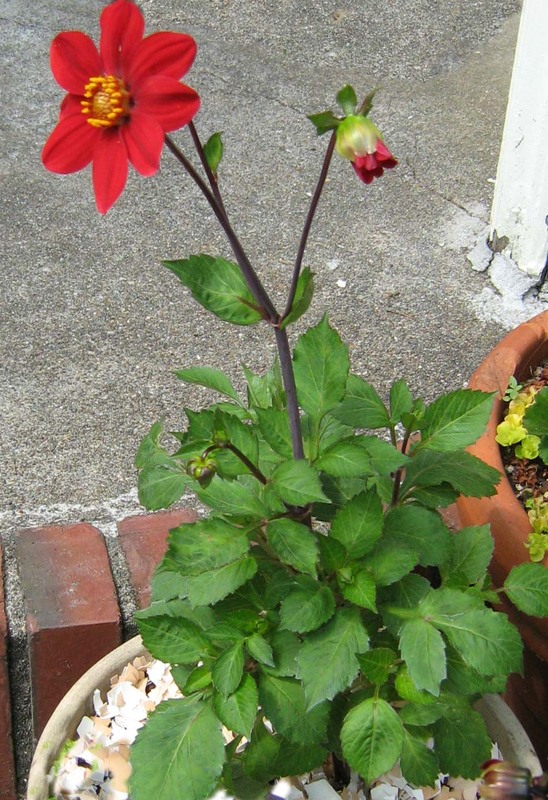 The dahlia had a few aphids on two leaves, but a good rinse with the hose was all it took to dispel that menace. While dwarf dahlias aren't grown for use as cut flowers, Andy says he cut some Baby Reds at the farm for his mother, Colleen, to use in wedding flowers last weekend, and they looked stunning. I'm timing this first bloom for on-the-plant survival, but the next bloom will go into a bud vase to see how it holds up as a cut flower. Stay tuned.